RICHMOND, Va. – As a preschooler in the children’s group called Mission Friends, new Southern Baptist missionary Amy Jones learned about God’s desire to gather people from every nation, tribe, people group and language by His grace and for His is glory. Her husband, Casey, added that as single adults, God brought the couple together at Travis Avenue Baptist Church in Fort Worth, Texas, where they helped develop leaders and start churches. “Now, Travis is sending us to Europe where the world celebrates 500 years of Reformation to participate in a new spiritual awakening,” he said. Time and again during the Sending Celebration, the new missionaries shared how God’s influence in their lives as children, teenagers and young adults from all over the United States — and even from around the world — has matured into an obedience to share the gospel among the unreached peoples and places all around the globe. Candace Gagnon* learned about missions as a child in Vacation Bible School, and then she participated in missions as a youth on a short-term trip to Mexico where God called her to international missions. Her husband, Kevin*, says the Lord used local church missions and working at Christian summer camps to develop his passion for reaching the peoples of South America. The couple is being sent by Lawndale Baptist Church in Greensboro, North Carolina. David Luca* said growing up in Eastern Europe, under a strict Communist regime gave him appreciation for having a Bible and reading God’s Word. He later began reaching out to lost people in his home country and neighboring regions. Now, he and his wife, Julia*, are being sent by a church in Georgia to North Africa and the Middle East. For Lucy Jackson*, it was in Girls in Action that she was first “exposed to the reality that not all people around the globe have access to the good news of Jesus,” she said. Jackson and her husband, Doug*, also are being sent by a church in Georgia to North Africa and the Middle East. Later, “God drew us to a missional inner-city community in Memphis where we were exposed to and challenged to seek the lost in hard places of this world,” Doug added. Sean Hyong* was in a worship service in high school, with tears rolling down his face, when he felt God leading him to take the gospel to the nations. His wife, Elizabeth*, was on a mission trip in college when God called her to full-time mission work. Now the couple is being sent by their California church to the unreached peoples of Central Asia. “God brought me, Margie, from an orphanage in Romania to send me to South Asia,” said Margie Rose*, who is being sent by her church in Virginia. “I was called by God at summer camp while listening to the testimonies of missionaries,” she said, noting God confirmed His call on her life while she ministered among Gypsies in Slovakia and during two years in South Asia. Each life story shared by the new missionaries flows from a heart of obedience to Christ, IMB President David Platt said at the Sending Celebration. Platt called the appointees to continue to pour out their lives in selfless love for Christ. He referred to Scripture in Matthew 26, where readers are curiously drawn to a quiet woman who holds an alabaster flask full of perfume worth a year’s wages. She approaches Jesus and pours the perfume on His head — an act that Jesus ascribed as a gift of honor and beauty. The story revolves around the reality that Jesus was about to die, Platt noted, and the woman realized Jesus’ death was the reason He came in the first place. He came to save sinners. The woman took the risk to pour out the valuable perfume, Platt said, because she knew Jesus was worth it. And for the new missionaries, it makes sense to leave behind earthly pursuits in sacrificial obedience to Jesus. “Jesus is worthy of your unashamed, unrestrained, undivided, unadulterated devotion,” Platt said. 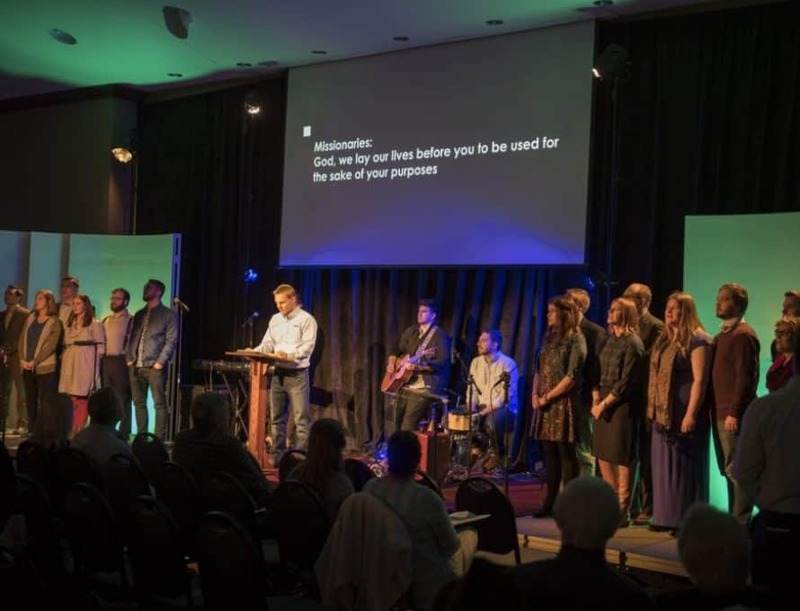 Whether prompted toward full-time mission service as a child, a youth or an adult, the missionaries shared that their obedience to full-time mission service is rooted in that devotion to their Lord and the direction He has given through Scripture. “In Psalm 96, we are instructed to declare God’s glory among the nations and to tell of His marvelous works among all peoples,” Harvey Sparks said. He and his wife, Jenifer, are sent by Temple Hills (Maryland) Baptist Church to Sub-Saharan Africa. “In Mark 16, Jesus commands His followers to ‘go into all the world and proclaim the gospel to the whole of creation,’” Jenifer said. “In Scripture, the call to take the gospel to the nations is clear and compelling, and so that is why we go,” Harvey shared.